The altar is at the centre. It represents Christ, the fixed-point of time and space. On each of the four sides of the altar there is a cross with an enamelled angel inserted into the corner. This brings to mind the words of Eucharistic Prayer I: “command that these gifts be borne by the hands of your holy Angel to your altar on high”. When the College community gathers for prayer, it joins with the Glorified Lord and with Our Lady and the saints in heaven in giving praise and glory to God the Father. In this way the pilgrim Church on earth is united with the glorious Church in heaven. 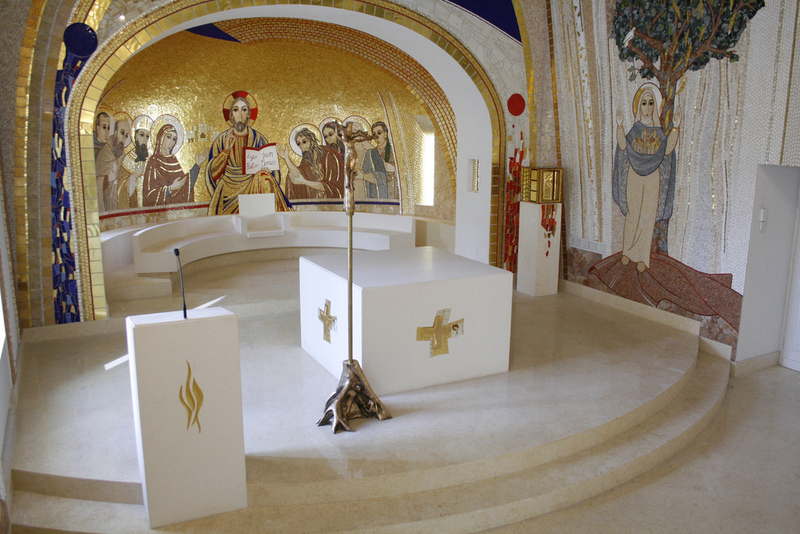 This idea is also expressed in the arrangement of the seating in the sanctuary: the two rows of concelebrants in the apse visibly join with the third row of saints in the mosaic directly behind them to form one group gathered around the glorified Christ. Traditionally, the apse of a church represents the bosom of God the Father who generated the Son and from whom all comes and to whom all returns. The community that gathers to pray, then, is inserted into this mystery of beginning and end, and with Christ acknowledges God the Father as the source of all life and as the ultimate fulfillment of all creation.